🔺Is it a coincidence that 95% of people lose financially? 🔺Is it a coincidence that 95% of people with degrees never get rich? 🔺Is it a coincidence that 95% of people work for the other 5%? Make sure to leave a 5* review and share this episode with an entrepreneur who’s on a mission. Speaker 1:0:04Welcome to the maximize podcast. I am your host nodes. Each week I'll be delivering high value, high impact content to help you take your business and your life to the next level. Join in on the conversation by visiting [inaudible] DOT com. There. You'll find our blog, our social channels, and tons of free resources. So let's get started. Speaker 2:0:33What's up everybody? 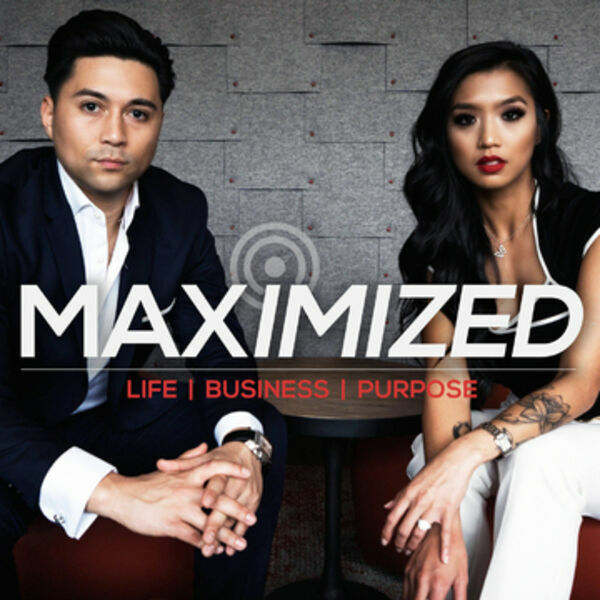 This is episode seven of maximized. Uh, this conversation today, I debated with myself actually to see if this was something that you know, I should talk about just because I think for a lot of people we get into this conversation, it might turn some people off, but hey, it is what it is, right? So the purpose of me doing this podcast is to be able to share information in a very authentic and raw way, uh, with our listeners. And so I want to get right into it. Speaker 2:1:03Last week we talked about the financial thermostat and what that means to somebody who is trying to make that transition. You know, we've been on this conversation to becoming an entrepreneur full time and transitioning from an employee to entrepreneur and the thermostat breaks down the internal blueprint that people have and kind of just to remind you guys, you know, let's say that internally you had a set point that's like right around $50,000 per year and then for whatever reason, let's say you start making 100 grand a year. Well even though you started making more money, which is an external change because internal conditioning and because of the habits and the mindset that you have, you will then somehow some way end up sabotaging your financial situation and get back to 50,000 per year. And so the example we used was the lottery winners and professional athletes. People who come from nothing and have no money, then all of a sudden come into big money in. We know that just on average three, four, five years later, uh, most of these lotto winners and a broke right back to where they were before they ever made all that money. And it's not because the money changes. It's because they never changed. So just because you change your income doesn't mean you change, right? And so the conversation last week was really about understanding the internal game of money. Speaker 2:2:51say 95 percent of the population end up dead or dead broke. I'm not just talking about people who were at a poverty level, we're talking about educated professional people, people with degrees, people who have a career. These individuals still end up in that bracket by age 65. So I'm not isolating, you know, poor people in America. No, I'm talking about across the board, so for every 100 people who reach age 65 and that includes Caucasian, Asian, Afro, American, Hispanics, that includes everybody. So for every 100 people who reach age, 65 statistics show that 95 percent of people are dead or dead broke. So how can that be the case even for people who were making 50, 60, 80, 100, 200 grand a year, they still end up in that situation. How is that a situation in the first place? Speaker 2:3:40Blows my mind because this is not something that's new. This is not a new statistic that just came out like last week and this is something that has been known for decades. Right? And so I think we look at the last 100 years, even 200 years, 300 years. It's always been the case. The majority of people end up in the end losing financially in a small percentage of people figured out and end up winning in owning the test board. Right? We talked about the chess board, so I want to go deeper into that and that's the big question I want to figure out and uncovered today. Speaker 2:4:57in my life, my own personal experience. My parents were nurses and um, there were making whatever they were making during the eighties, which was I guess considered decent middle class income. Our house was like a $100,000 house that we moved and not even was like an $80,000 house. Our first house in the eighties. And then we had my sister and whatever. Cut a long story short. We had an average income average lifestyle as a kid growing up and my parents were working all the time. I mean I never saw my parents together because either my mom was working during the week or were with my dad and then my dad would be working over the weekend and then we meet with our mom and then during the summertime they were both working so we'd be home by ourselves. So that was something we were used to. Right. It was just never seeing the two of them really together. Speaker 2:5:39And of course my parents did the best they could. They would go on vacations every so often. And that was great. So we had a great life, you know, considering what it was, you know, there are two nurses making decent income. The first time I realized that I was different financially, it was when I started hanging out with a friend. So, um, I used to do martial arts, I think I was like five, six years old at the time when I got involved and it became really, really good friends with this kid named Albert. And um, I ended up going to his house after class one time. I was like six or seven. I remember it because it's really woke me up and I remember going to his house and we pulled up to his house. His house was like ridiculous. It was like a mansion and I was like, well, this is your house. Speaker 2:6:15He goes, yeah, one of them, I don't think the kid really understood what was going on. He was a little older than me, but in my mind I was like, I had never seen a house like this, had never been around a house like that or people like that. We walk into the house and it's beautiful. I mean amazing staircases. It was just ridiculous. Yeah. Maids live in nannies. He had a full time chef that God had a pool in the backyard on a lake. He had a tennis court and multiple cars. His father was a doctor. My parents were both nurses and his mom didn't even work in that experience. Immediately say to myself, Whoa, this is crazy. Look at this. How come I don't have this? How come we don't have this? I went, remember going back to my house, my little house compared to their house and it did something to me. Speaker 2:6:57It really created an awareness around, okay, we don't have what they have and for the first time I think it hit me that, wait a minute. So there are people who actually have more money and there's people who are rich and we're not. I'm not rich, we're not rich. And so that kind of woke me up a little bit. I mean, I was six or seven years old, but then that continued to happen because what ended up happening is started going into school, middle school and then everything that comes with that, you know, going into a new school and you're around kids and you know, obviously kids who are wearing different name brands, you know, my parents, when we couldn't afford that, we didn't buy nike shoes or anything that was expensive like that, we would go to payless and by the whatever brand new had there and he used to make fun of us because they don't make fun of my shoes saying calling them bobos. Speaker 2:7:45I remember that. And so growing up, my experience around money was, man, we don't have money. Right? And I remember the conversations with my parents. My mom would always say, we don't have money. We never have money. We don't have money. So that conditioned my mind, my thinking that man, we're broke and it is what it is and there's nothing we can do about it. And something in me kind of started to, I guess wake up as I started getting older and sort of reading and learning about business and entrepreneurship and then finally had a chance to turn my first business at 16 out of necessity because I couldn't find a job. That's when I had my first taste of actually making my own money. You know, I got hooked after that and then the game completely changed. So what ended up happening after that, because I got a taste of money, I started going beast mode with business and then got into network marketing and instead of making 10, 15 grand a month, and then what ended up happening, here's where the story ties in. Speaker 2:8:35I started making all this money at the age of 18, 19. But the problem was I had never developed the skills to manage money and not just that button. My parents now still live with my parents at the time. They had never seen this kind of money. They thought I was doing something illegal. And so, you know, immediately, etc. Big money. They had a negative reaction like, oh, this can't Be right. What are you doing? Are you selling drugs? Are you scamming people? What's here? So it was like an immediate negative reaction when they started seeing the money being made. And Then once they saw the money was real, you know, they couldn't really give me any advice. All they could say is, hey, don't waste it. Right, don't spend it on stupid stuff. But that was it. And for someone who's 18, 19, making 15, 20 grand a month, even though that's really not a lot of money, but for an 18, 19 year old who never made money, that is a lot of money. Speaker 2:9:19And then my parents at the time were making like 50, 60 grand a year. So I was already making more than both of them combined. So the breakdown happened where they couldn't give me advice on what to do with my money. And so since I had no idea what to do with my money, of course I ended up just blowing the money. And so what's the purpose of time that story into this? Well, I think the story goes into most people were actually conditioned to be poor. We're conditioned to fail and lose the money game and it's not on purpose, it's just because it is what it is. Like we're born into a family that have a certain level of understanding about finances and money, you know, and if you're a family, our employees and they come from a lineage of employees, well that's not in their thinking, right? Speaker 2:10:02It's not in the realm of awareness. So you know, people are born into a set of circumstances and it's not the old, they don't have money, they have money really. It's just a way of looking at the game of money. So my parents came from a perspective of defense rather than offense. It was more about saving rather than making where I was coming from a place of limitation rather than prosperity and abundance. And so they didn't understand the idea of abundant thinking and hoW to be wealthy and think beyond what your paycheck is and all that. So that's the circumstances I was born into. you know, something I had to learn in. great. But most people are born into circumstances like that because if the statistic is true that 95 percent of people are broke, busted, disgusted, right? ThAt is the case. Then that would be safe to say that the majority of people born into families, into what? Speaker 2:10:43Ninety five percenters and being a 95 percent are entails a mindset, a perspective, a way of thinking and operating when it comes to the game of money, but then it gets worse because not only are you born into a set of circumstances with type of beliefs and cultures and perspectives about money, you then go to school and when you're in school, guess what? The school system, the education system, the whole entire process is not designed to open your mind and help you think in terms of wealth and the wealth principles, but what they're really trying to do. In fact, it may not be on purpose or intentional, but it just happens. They're educating people on how to do what? Get A job. You're educating people how to do what? Pass test, which means what? Memorize information. So ultimately school's preparing you. It just a breeding ground for 95 percenters. Speaker 2:11:29Not to mention the people who teach at schools, teachers are also 95 percenters. I mean they make less money than the average income here in the United States. So think about it. People are born into a set of circumstances with cultures and beliefs and exposure because of the family that is in terms of the game of money and how these people look at the money. So as a child, that is what your exposure is. You step into school and you're in school from age five to 18 or 17 and guess what? You're being taught. You're being taught hoW to be an employee by who? Teachers who are also 95 percenters is being ingrained in your mind. And of course if you're in a neighborhood where everybody, let's say the average income medium income is around 40, 50, 60 grand a year, where everyone who goes to that school comes from a 95 percent culture as well. Speaker 2:12:10So not only are you being taught by 95 percenters, not only are you being raised by 95 percenters, but all your peers are 95 percenters. So it's a conditioning that's happening from the very early stages of our life and then it perpetuates because then once we get to high school, the whole game is let's graduate so we can get into college because if you get into college, we're going to get a great job. And then what happens? We then do what we need to do. We did into college, but in order to get to college, gueSs what? We got to take out student loans, right? So we get into debt. That is our first taste of taking on debt. So we take out a student loan, 10 grand, 15 grand, 20 grand, and then while you're in college, you're getting student credit cards, right? Maybe you're getting your first car, who knows? Speaker 2:12:54Maybe you're trying to find work and begin to start making some money. And ultimately what happens through college experience when we know the vast majority of college shoes are not everybody okay? But the majority of college students who do graduate end up graduating with debt, they graduate with student loans and the idea is if they graduate with a good education, right, they're going to get a degree and that degree is going to allow them to get a job and that job will allow them to do a payback. The student loans for their education. But here's what happens. They end up getting a job in most cases. It's interesting because most cases people graduate with the degree they can even use. So they ended up getting a job that's outside of their field of study. Isn't that crazy? But for whatever reason, let's say they end up getting a job most of the time because companies aren't really hiring based on what degree you have. Speaker 2:13:42They're hiring based on your experience. But because you had no experience, you can't get paid what you think you're worth. Instead you're going to get paid what they think you're worth and they're going to pay you based on your lack of experience. So then you're now making like 30, 40, 50 grand a year starting. But meAnwhile, you've accumulated 40, $50,000 worth of debt, not to mention the credit card debt, not to mention the auto loan that you have. so you're now starting life at the age of 18 or 22. Actually, by the time you graduate, probably 23 or 24, 25, you're graduating, stepping into the real world. Now, here's what your experience has been thus far. You have been raised up by 95 percent or so. You have been taught by 95 percenters. You had been surrounded by your peers who are all 95 percenters. You then went into college and in high school and college to then do a get trained and educated on how to get a job. Speaker 2:14:31Which means prepare yourself to be at 95 percent are not once did you learn about wealth. Not once did you learn about how to build a business from the ground up. And it's interesting because if you look at the most successful entrepreneurs, most of them did not finish college. Most of them did not finish school. So bottom line is you spent from age, let's say the moment you became aware, like three years, four years old, five years old, until about 25 being conditioned, you graduate college with a bunch of debt, right? Thousands of dollars in debt, and now you're getting a job that you're having to work nine to five, 40 hours a week, every single week you're getting your paycheck every two weeks. And in this process, what begins to happen? You start paying taxes and now you realize, wait a minute, what I'm making is not enough, right? Speaker 2:15:14Um, then you get more credit and then maybe you meet your significant other. And then what happens? You decide you want to get married. So then you got to pay for a wedding, then you got to go and do all that. And then, hey, well now that you're married, you can't live with your roommate anymore. So now you got to move into a place together. So that requires what? More money. But if you're still in debt, what are you doing now? Taking on more debt. Maybe you buy a house, you'd get a house. Guess what? A 30 year mortgage, so now you've basically signed your life away for the next 30 years, taking on that mortgage simultaneously. WhAt's happening? You're still working 40 hours a week, 50 hours a week, and it's crazy because what wasn't enough before with the debt you had is not going to be enough. Speaker 2:15:50Now with the added debt you've created, even though maybe your significant other's making an income as well, they got their own stuff they're dealing with and so what ends up happening for most people, because you're conditioned from age five to 25 to be a 95 percent or they're not taught money management skills are not taught wealth and entrepreneurship. So by the time they're 25 years of age, they'd make all these mistakes. They get into massive debt and now they are enslaved to the debt and when you are enslaved to the debt, what that basically means. Now everything you do is designed to do what? Make money to pay off your debt. But now that you have all this debt, you'll never really get out of this debt trap. And that's what this conversation is called. The debt trap, it's not the death trap, it's the debt trap. Speaker 2:16:35So what keeps people stuck in on the jouRney to brokeness the 95 percent living is the fact that they get into all this debt at an early age and because they were never trained on skills on how to make significant income, like they don't have million dollar skills, they have $50,000 skills, right? They don't have multimillion dollar skill sets, not just at but they don't have a million dollar discipline when it comes to managing money or understanding how to create money. so because of that there are limited to all that they know and because all that they know is what they know, they can only do what they can do and what they are doing is what perpetuating the situation you're in. So they were 40 hours a week, 50 hours a week, getting tired, getting burned out, frustrated about their financial situation, living in debt, you know, they're not working to be free, they're just working to pay off that they've accumulated. Speaker 2:17:22So over time, what ends up happening is 35 comes, 45 comes, the kids come right adventure, the kids got to go to college and then while you're perpetuating and deBt again, and then you do that to you're about 65, by the time you're 65, guess what you find yourself in the category solidified concrete permanently as a 95 percent of what? A sad story. But that is the story of the majority, the story of the masses. Now, does it hAve to be this way? It doesn't have to be this way and I'm a testimony that it doesn't have to be this way because here's what happened for me. I graduated high school, right? And then I went to college and my thinking was, I'm going to go become a lawyer because I couldn't make a lot of money by being better. Boom, boom, whatever. But the issue was I had to pay for college and because I didn't have the money and I did take some loans out, but I couldn't get enough to pay for law school. Speaker 2:18:07I had to figure out other alternatives. But because I had that experience of entrepreneurship at 16, I started thinking to myself, man, I just need to start making money on my own, and that's when I got introduced to the idea of becoming an entrepreneur, starting my own business. So I got involved in network marketing in the valley for network marketing. A lot of people have like a negative connotation of perspective around network marketing, but the value for network marketing for everybody, I don't care who you are for everybody, is that it begins to put you in a position to think and act like an entrepreneur. It gets you in a mindset from trading hours for dollars working for somebody else as an employee to now becoming an entrepreneur and working for yourself and hustling and getting paid and doing what you need to do to make your own money. Speaker 2:18:47And that's exactly what it did for me because it gave me that injection of entrepreneurship that I never really experienced before. So I started educating myself. I started reading all the books, listening to audios. I literally started reconditioning my mind for wealth and prosperity. You know, sort of listening to people like a bob proctor, like a tony robbins, right, a like a zig ziglar, it, all these individuals who had, you know, incredible information out there on the internet and the obviously back then this was like in 2004 and five, the internet really began to start exploding. Information became widely accessible. Then youtube came out, forget about it, so at that point I was able to reach into the internet and the libraries that had all the information and begin educating myself and literally unlearning all the past conditioning and started really learning how to be an entrepreneur. Speaker 2:19:35Firstly, island was skills, right? I learned the skills to be an entrepreneur. I went out there and sort of making a lot of money, but what I failed to understand was how to actually manage the money. So what ended up happening, I blew all the money, right? I didn't know what I was doing. I still had that 95 percenter residue, if you will, when it came to relationship with money. But then I figured it out. That put me in a situation where I had to get wise and figure things out and then what happened? Boom. Started making money again because why I mastered the skills. So I went on and created even more income and simultaneous to that I will smarter this time around. I was wiser this time around now I understood the whole concept of why you need a corporation, why you, how to deal with taxes as an entrepreneur. Speaker 2:20:11And so ultimately what happened for me in my journey was I was raised up in this environment, this culture, just way of thinking as an employee in 95 percent or whatever. And I literally had to recondition my thinking, recondition my mind. And I'm glad I actually did not graduate college. I don't wear like a badge of honor. I think it's still good enough, get educated or whatever. Uh, but it's not necessary, right? You don't go to college so you can become financially free. You go to college, we can get a job, but I think it's fine if someone wants to finish college, nothing wrong with that. You know, if I had to choice to finish college, I probably would've finished college just to say I finished college, but also having a realistic understanding that college is not the thing that's going to make someone rich, wealthy and fruit, but looking at everything that happened, it literally put me in a position where I understood the debt trap right away. Speaker 2:20:54I saw with my cousins who all went through different universities. They all graduated top of the class and when they graduated they were broke and couldn't even do anything and they're moving back home with mom and dad. Right. But that's not just some people. That is the majority of people. The majority of people are actually being conditioned from age five to 25 to be at 95 percent are. And then based on the decisions they make when they're 25 to 35, they set themselves up to be in debt for the rest of their life. So now as a result of being in dagger, basically a corporate slave, right? You have to work to pay the bills. You have to work to pay the mortgage, have to work to pay off the student loans, and you can't get out of it, and that is the traps. Either real trap is this. Speaker 2:21:30The goal should be to become free, right? That is really what everybody should be striving for is freedom. It's not about becoming a millionaire. It's not about becoming a multimillionaire, not about driving a rolls royce or living in a mansion. It's About freedom. True and absolute freedom. Freedom means you can do what you want, when you want, with whom you want, with no restraints, no restriction. When you are in debt, you are not free because you do not control your time. You cannot decide what you're going to do on a monday, 2:00 in the afternoon, no. Why? Because you have debt and because you have debt, you have to beat your job so you can go get paid so you not get fired because you need that money, right? You need to sell your time for that money to pay off your debt. That's the trap because your debt is actually producing someone else's wealth. Speaker 2:22:13Let me say one more time. Your debt is actually producing someone else's wealth. You see how that works. Your enslavement is actually creating someone else's freedom in a corporate structure. As an employee, we know everyone gets paid a fixed amount based on time, right? But understand that people who own the company, they don't get paid for time, they don't get paid for time. See, when you get paid for time, your income is addition and subtraction. When you get paid on the efforts of others, your income is based on multiplication and you can't get wealthy. If you're in the game of addition and subtraction. When it comes to money, the only way you get wealthy is to the game of multiplication, and the only way you can do that is if you are an entrepreneur where you can leverage time, you can leverage other people's time, leverage other resources, leverage other people's information, and that's how you get truly wealthy overtime in your own business. Speaker 2:22:57So the goal should be free because if you're free. Here's a big question, what would you do if you were completely free? If you didn't have to worry about money, if money was no longer an issue, like he didn't have debt, you didn't have to pay bills, everything was covered like let's just say boom, hundred million dropped in your bank account. You're free now. What would you spend your time doing? Think about that. What would you spend every moment of your life doing? The answer would be whatever you want. You want to travel the world. That's what you're going to do. You want to write a book. That's what you're going to do. You want to start a charity. You have a mission. You want to build and create a cause you want to pursue. That's what you're gonna do you know everybody has this thing within themselves that they are called to do, right? Speaker 2:23:37Some may call it their purpose, so may call it their destiny. They're calling depending on, you know what? Yeah, whatever you want to call it. Everybody has this thing that they know deep down inside is what they want to do, but they lose that. They forget that and eventually they get to the point where they don't even realize that there was something there because now they're so distracted with the grind. You're so distracted with the job. They're so distracted with the bills are so distracted with watching netflix and showtime and all the tv shows and the world cup there are so distracted on all these other external things. They lose sight of the most important thing which was in his freedom, their freedom, because you're not alive. You're not really living until you're free. That Should be the goal for every sIngle entrepreneur is to become wealthy, wealthy, non necessity of hundreds of millions but wealthy in the sense that you are free, right? Speaker 2:24:27So that's the conversation. And freedom is the ability to do what you want. When you want, however you want. Now, I want to let you know that freedom is power. People say, oh, wealth is power. Money is power. No, no, no. Money can buy your time back, right? So time. If you own your time, that's freedom. Freedom is what's power because if you're free, that means you have the power to create. He had the power to think you have the power to do. You have the power to go out there and build relationships. You have the power. Now being free is what's going to give you the power, and now here's what power is. Power by definition is the ability to do something or act in a particular way. So power, in my opinion, is synonymous with change. So if you're truly free, that means you have the power to create change. Speaker 2:25:08but what kind of change? Well, I don't mean change like, okay, you're going to change your clothes or the change you have in your pocket. I'm talking about like change the world or change your life. Change the lives of the people around you, live out your destiny, live out your purpose and mission, and that as a result creates drastic change for the world around you. Right? That's the type of change we're talking about. most people are living a small life. They're living a life that actually makes no impact. The only impact they actually do make is like, okay cool. Let's go to the movies. Everybody or you know, whatever impact you make is just the contribution you're making to your boss and the company you work for, and that's basically the biggest impact you're making. So the truth is, if you're free, you have the power to create change. Speaker 2:25:51Now what is the opposite of free and power and change with the opposite of free is enslaved. You see how that works and enslaved to what your debt, and if you're enslaved, that means your power list because now you cannot choose what you do with your time. You cannot choose what you do at your energy and resources, and that is the most valuable thing we're all given on this earth in our life, is the ability to have time and be able to take action and make decisions. That is a gift, right? And so because you're in slave to debt, you cannot use your power. You are powerless now and as a result you cannot create change. So you're stuck and as a result of things staying the same, you cannot create the change. Everything stays as is. So as a result, you can't create ripples in the water. Speaker 2:26:31You can't change things up and so maybe that's kind of how and how people want it at the top, right? Maybe that's how the super successful people want. Maybe that's how your boss wants it, right? They want to keep you so distracted with making a paycheck and get drunk on happy at 5:00 PM every day and get more in depth so you can continue working for him because he knows as long as you're in debt, he's got you and he'll continue to buy you wholesale and sell retail and remember your debt is going to be his freedom and I'm not here to bash jobs or bash companies or bashed corporation. That's not at all what I'm trying to do here because I know people who do have a job and you're free. I know people who have jobs in your free. They have a job that they love. That's why they worked their job. It's not because they have to, and that's the conversation today to get to a place where you do you whatever it is you decide to do whatever job, whatever work you decided to do, you do it because you want to [inaudible] you love to not because you have to that you are really coming from a space of true freedom because freedom equals power. Empower equals change and change is what we're all here to do. We're here to change ourselves, change the world, and make a major impact. Speaker 1:27:32I hope you enjoyed today's session. Have maximized. Make sure you check us out at [inaudible] dot com and subscribe and you'll get access to all our free resources. Also, make sure you follow us on twitter at max, a nols, our youtube channels where we actually had the video version of today's podcast and I look forward to seeing you guys next week. Take care and have a great week.